172 pages | 31 B/W Illus. What role can strategic thinking play in contemporary sport management? It can be the difference between leading or languishing – it’s that important! 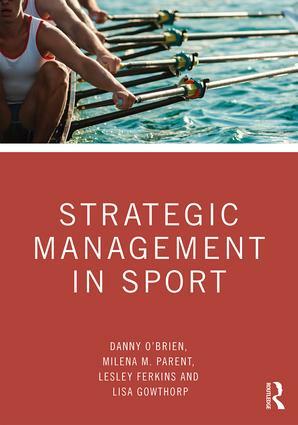 Covering sport at all levels, from community-based sport to elite sport, this is the first textbook to focus on strategic management in a sport context. The book introduces the fundamentals of strategic planning, environmental analyses, strategic direction and leadership, strategy formulation and selection, implementation, strategic control, and change management. Designed to encourage students to develop a strategic mindset, as well as critical thinking and problem-solving skills, the book unpacks key concepts such as leadership, governance, organizational change, and the multiple layers of strategy in sport. Full of real-world case studies from diverse, international sport business environments, and useful pedagogical features such as review questions and guides to online resources, this is an essential text for any sport management course and an invaluable resource for sport development, recreation management or events management courses. Danny O’Brien is Associate Professor in Sport Management, in the Bond Business School, Bond University, Australia. He is Visiting Professor at both the Center for Surf Research at San Diego State University, USA, and the Plymouth Sustainability and Surfing Research Group at Plymouth University, UK. His research is in sustainable surf tourism, event leverage, and organizational change in sport. Each area shares a common strategizing for sport-for-development thread. He is Editorial Board Member for Sport Management Review, and Journal of Sport & Tourism. Milena M. Parent is Full Professor in Sport (Event) Management in the School of Human Kinetics at the University of Ottawa, Canada. Internationally recognized for her research in the management and governance of major international sports events, she is a North American Society for Sport Management Research Fellow and former holder of a Government of Ontario Young Researcher Award. She also consults with government and industry organizations on their governance, management, and sport event hosting. Lesley Ferkins is Professor and Director of the Sports Performance Research Institute New Zealand (NZ) at Auckland University of Technology, New Zealand. She has worked closely with boards of national sports in NZ and Australia as part of action research interventions to develop board strategic capability. She has an ongoing programme of research in leadership and governance with NZ Rugby and is part of an international team evaluating action research impact in multiple countries. She is Associate Editor of Sport Management Review and sits on the Editorial Board of the Journal of Sport Management. She also sits on the board as Independent Director for Tennis NZ. Lisa Gowthorp is Assistant Professor in Sport Management within the Bond Business School at Bond University, Australia. Her research interests include sport governance and sport policy within Australian high-performance sport. She consults with industry and is the Vice-President of Sport Management Australia and New Zealand (SMAANZ) and a Director on the Board of Paddle Australia.